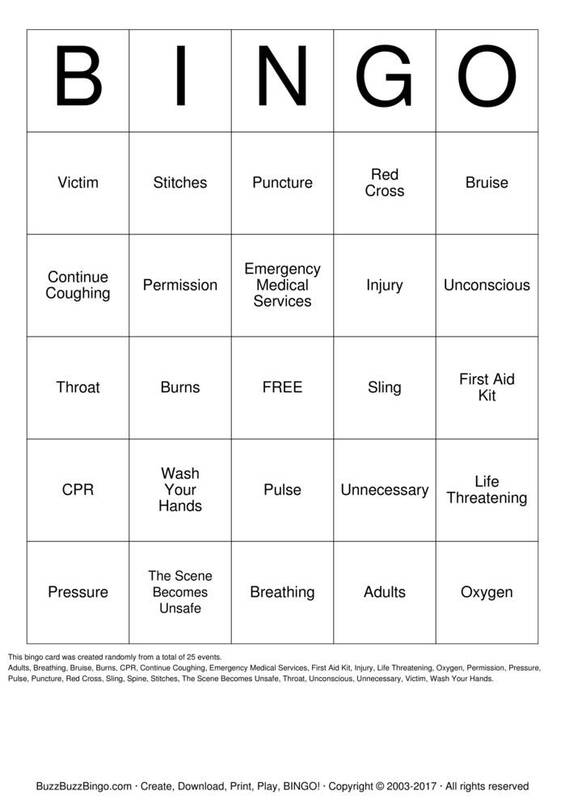 First Aid Bingo Bingo Cards to Download, Print and Customize! Print 2 pages of First Aid Bingo Bingo Cards for free. Download a PDF with 2 free pages of bingo cards plus instructions and a randomized call sheet. Play First Aid Bingo bingo in a browser or customize the events, free space, etc. Purchase more randomly generated bingo card pages below. Adults, Breathing, Bruise, Burns, CPR, Continue Coughing, Emergency Medical Services, First Aid Kit, Injury, Life Threatening, Oxygen, Permission, Pressure, Pulse, Puncture, Red Cross, Sling, Spine, Stitches, The Scene Becomes Unsafe, Throat, Unconscious, Unnecessary, Victim, Wash Your Hands.